The Encage™ plugin provides SDS (Subdivision Surfaces) features to EIAS Animator. select feature to let you decide which plugin system is best for your model. Encage respects the UV coordinates of its child groups when smoothing the models. 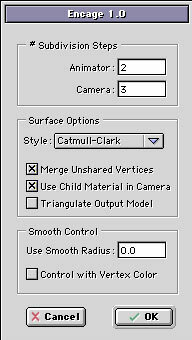 Smoothing values, plus animatable parameters.